National Penn Bank has a longstanding reputation for honesty, integrity, and performance in Bird-in-Hand and surrounding areas. Because they like to be involved with the communities they serve, they have become a Presenting Sponsor for the Bird-in-Hand Fire Company’s Lancaster County Carriage & Antique Auction. They are a tremendous financial supporter of this very important fundraiser, one of the major events of the year for the Fire Company. The relationship between the Bank and Fire Company evolved over the course of a decade. In 2000, bank officials creatively dreamed up the idea of hosting an annual pig roast as a way of showing appreciation to their patrons. The first event was held under a big tent in the middle of an alfalfa field on the Smucker Homestead in the heart of Bird-in-Hand. In the early years the pig roast was on Thursday evening before a weekend community celebration called HomeTowne Heritage Days. Heritage Days was organized by the Bird-in-Hand Corporation and underwritten by HomeTowne Heritage Bank, a division of National Penn. These Lancaster-area branches were branded as National Penn in early 2012. When the Carriage Auction moved to Bird-in- Hand in 2008 and became a fundraiser for the Hand-in-Hand Fire Company, National Penn began working closely with the Fire Company volunteers. The week of the pig roast and Carriage Auction at the end of June is a festive time for the community of Bird-in-Hand and all of its guests. The two events are very compatible and the Bank and Fire Company work extremely well together. Being able to use the tent, electrical and water lines, and restroom facilities for more than one event makes the effort of setting up the venue in the middle of the field so much more worthwhile. On Tuesday evening 2,000 by-invitationonly bank patrons stream into the tent for a delicious down-on-the-farm meal of pork barbecue sandwiches, baked beans, and salads topped off with traditional Lancaster County meadow tea and ice cream. The Bird-in-Hand Fire Company handles the traffic and directs cars to the fields designated for parking behind the large tent. After greeting their neighbors and enjoying their complimentary meals, patrons love to browse through the rows of antiques that have already been brought to the site for the Auction. This is great advertising for the Fire Company’s event held on Friday. Tom Jordan & Donna Dessen present National Penn Bank’s generous donation of $7,250.00 to Chief Lonnie Kauffman, President Tim Hoerner, and Jake King (not pictured). Naturally, the Fire Company needs the massive tent for the sale of carriages at the end of the week. It is a significant help to have the financial contributions of National Penn to cover the cost of the tent rental and infrastructure. Banners announcing this partnership with National Penn are displayed in highly visible areas during the Carriage Auction so that the 3,500 auction attendees know that this is a bank that cares about the community. 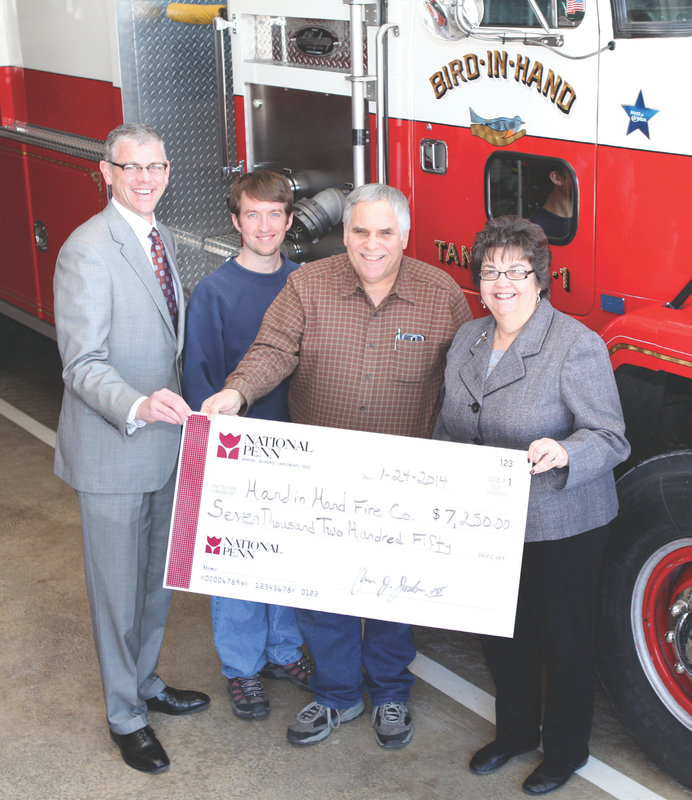 Hand-in-Hand Fire Company members appreciate the goodwill of their friends at the bank and with National Penn’s significant financial support, they can provide better fire and safety protection in their community.